Note: All quotes on this page are derived from letters in the St. Mary's archival records. Archbishop Sinnott was born in Prince Edward Island in 1877 to a family of Irish descent. He was very well educated and rose quickly in ecclesiastical honours. Ordained in 1900, he became secretary to the Apostolic Delegation to Canada in 1903. He was named a monsignor and made Private Chamberlain to Pope Pius X in 1907 and was only 38 when he was named archbishop. He obviously knew the situation between Winnipeg and St. Boniface, in view of his role as secretary to the Apostolic Delegation, and may well have suggested the division into two archdioceses as a way to minimize the French-Irish disagreements. Sinnott found his first years as archbishop very challenging. Two related problems created the difficulties he faced. The first was St. Mary's huge debt; the second was the transfer of St. Mary's from the Oblates to the new archdiocese. Because of these problems, Sinnott did not officially announce that St. Mary's would become his cathedral until late 1918. In September 1918, Sinnott had written to Rome regarding his planned appeal to his fellow North American bishops for financial help. He also asked the Holy See if it might be able to "exercise some influence" on St. Mary's Dutch creditors. In the same letter, he also wrote regarding his relationship with the Oblates. "I verily believe that they should shoulder a large part of the debt.... If I am obliged to take over St. Mary's parish and to take upon myself the worries...of paying off of such a colossal load, I shall ask permission to lay the whole situation before the Holy See and request a decision upon this matter." Sinnott summarized conditions as he saw them in his 1919 letter to the American bishops: "The conditions I found here on coming to take charge [of the new archdiocese] were indeed appalling...the only church at all suited [to be cathedral]...I found burdened with a debt amounting almost to $500,000. The church was in charge of the Oblate Fathers...and quite apart from a natural disinclination to dislodge them from a parish which they had founded almost 50 years ago, I hesitated to assume a liability that was crushing in its immensity. I waited for two years. The situation, instead of improving, grew worse and finally...reached the civil courts. Before imminent bankruptcy, and to save the honour of the Church, I felt I had to act, and the only way I could get creditors to discontinue proceedings was to promise to take over the church myself...at the beginning of December 1918." Because of their unhappiness about leaving St. Mary's, the Oblate order entered a case against Sinnott in Rome in 1919. Sinnott and Reverend H. Lacoste, an Oblate whom Sinnott addressed as "my old and very dear friend", attempted to broker an agreement which would satisfy both sides. He went on to propose that the Oblates return two pieces of land to the parish and that they also provide $50,000 towards the debt repayment. In exchange, Sinnott would grant the Oblates the parishes of St. Joseph's and Sacré Coeur in perpetuity. In 1922, the Oblate Provincial wrote to Sinnott to say that he wished to comply regarding "the fulfillment of the obligations imposed on us by the Holy See" as quickly as possible. 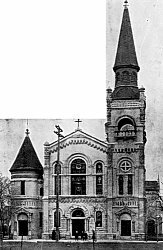 While these issues were going on, the parish suffered another financial blow in 1919. On St. Patrick's Day a fire did $30,000 damage to the church. Insurance money allowed repairs to be made. In 1920, Father (later Monsignor) Thomas Morton arrived from England. 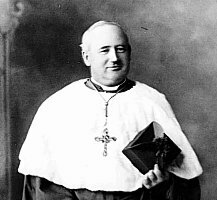 He was rector of St. Mary's until his retirement in 1934. Camp Morton, on land purchased in 1920 for an archdiocesan summer camp on the shore of Lake Winnipeg, was named for him. Sinnott was a tireless worker during his years as archbishop. He traveled so extensively throughout the archdiocese that he earned the nickname "Wanderer for Christ". He was also responsible for founding one college, 90 churches, 7 hospitals, and 3 orphanages. The college was St. Paul's, founded in 1926 as a high school for boys. 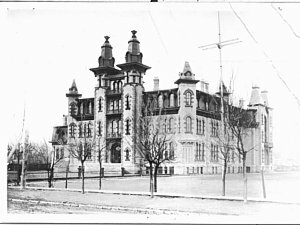 It became affiliated with the University of Manitoba in 1931, and the Jesuits took over its ownership in 1932. Coadjutor-Archbishop Most Reverend Gerald Murray, C.Ss.R, D.D. 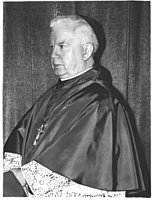 In 1944, Pope Pius XII named Most Reverend Gerald Murray, C.Ss.R, D.D., bishop of Saskatoon, as Sinnott's coadjutor. Despite the fact that he was 67 years old and had been archbishop for 27 years, Sinnott did not wish to retire. Murray, therefore, worked out of St. Ignatius Church until his death in 1951.